As many of you know, when I’m not blogging about parenting and family life, I’m a freelance writer, poet and personal coach. These roles used to be something I did around a more traditional day job (although that did include writing and coaching) and it’s only last year that I took the plunge and went fully freelance. So far, it’s been the best thing I’ve done. I liked my job enough… But I love what I’m doing now. So, what stopped me from doing this before? Well, a number of things that I’ve managed to move past but really, it was only when I hit my 30s that I even really considered having my own business as an option. It certainly wasn’t something I thought about as a kid. Back then, role models in books and on TV tended to have more traditional jobs such as doctor, policeman, fireman, builder, teacher secretary etc… If you asked a class full of kids then what they wanted to be then, you would usually get a variation of these roles, with the odd aspiring astronaut thrown in. Things have changed now, but not that much. We’ve got Fireman Sam, Bob the Builder, Postman Pat… And what about the women? Doc McStuffins’ Mum is a Doctor but otherwise they tend to be second to the men in these programmes. The only people in business are usually men running big corporations and are rarely portrayed in a positive light (remember the Lego movie?). So where are the entrepreneurial role models for our kids? As for me, I was lucky enough to have some role models around who did have their own businesses but they tended to be of the more traditional sort – running a restaurant or shop, for example. So while I saw the work that went into being self-employed, I never thought that more creative ventures were viable careers. So, although I dreamed of being a ‘writer’ of some sort, I told people I wanted to be a teacher because I liked kids and it seemed like the most creative option at the time. Fast forward to now and Mushroom and I have had lots of conversations about the work I do. He understands that I write (and likes it when I make up stories for him!) but I think he’s still not sure about the coaching. What matters (to me), though, is that he understands that different people have different jobs and that it is possible to do what you love and love what you do. The other day we played a game where he said he was going to buy ‘a really big boat’ like the one we saw on holiday (a yacht) and when I asked him how he would buy something so expensive he said “I did a lot of writing work so now I have a lot of money.” I love how anything is possible for him! Mushroom is lucky enough to have many different role models to look to when it comes to work. But how can we encourage entrepreneurial spirit in the next generation, regardless of their immediate influences? That’s where the people behind Clever Tykes come in. 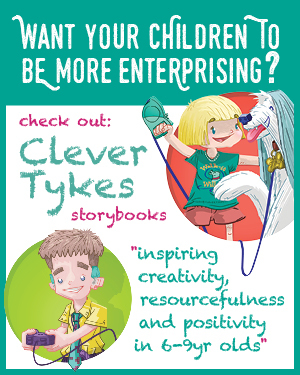 Set up in 2012, Clever Tykes is a series of books aimed at children aged 5-11 (reading age c.8/9years), which introduce children to positive entrepreneurial role models. Each story follows a child’s journey as they follow their passion to create a venture that they love. There are currently three titles in the series: Code-it Cody, Walk-it Willow and Change-it Cho. Mushroom and I were sent Code-it Cody and Walk-It-Willow to review towards the end of last year. I read them both first and while I thought they were great stories that clearly championed essential characteristics including innovation, hard work, goal-setting and teamwork, I felt that they were a bit old for (then 3 year old) Mushroom. However, a lot changes in a few months at this age so we tried reading Code-it Cody together recently (over a week, it’s quite long for little ones) and he really enjoyed it! With this title, I loved that Cody’s disability (he has a hearing impairment) is simply a part of who he is rather than being a big part of the story, as can often end up being the case with characters with disabilities. It would be good to see a girl in a similar role in a future book, to encourage more women to get into technology but across the series Cody is the only boy so I can’t say it’s not diverse. 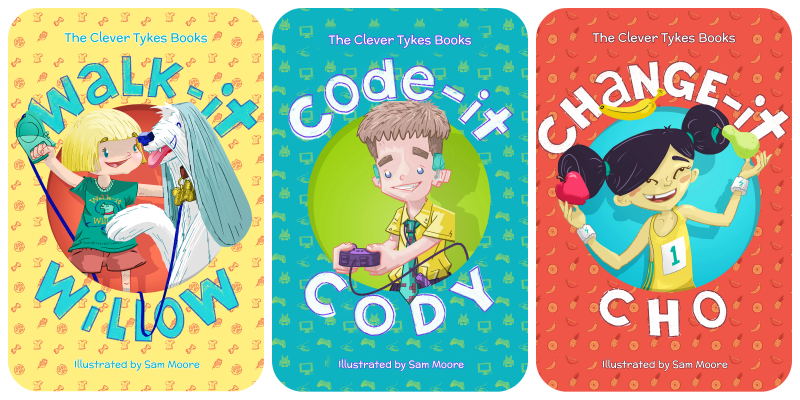 Clever Tykes are already working with dozens of schools across the country and they aim to eventually offer their books and related resources for free to all schools in the UK but you don’t need to wait until they reach your child’s school to get hold of them. If you would like to order one (or all!) of these books to introduce the idea of self-employment (other than your own job if you’re already self-employed!) to your children, you can do so by clicking on the image above. This sounds really cool, Rachael. I still have a traditional job, but one thing I want to encourage with my kids is an entrepreneurial spirit. For instance, I don’t plan to give them an allowance, even if they do chores to ‘earn it’ (for more than one reason). Instead I want to encourage them to see how they can earn it themselves. My eldest is still too young for this concept, but when the time comes when he asks for extra money, I’m going to encourage them to find ways to earn it. So maybe that’s making your own business, or selling your services. Basically I want them to be able to think beyond just doing work and getting paid, but thinking of how to earn money by creating things as well. Of course if my kids choose traditional jobs then that’s great too, but I don’t want to limit them either. That sounds like a great idea Nina! Mushroom is too young for an allowance too and now that you mention it I have never talked about it with him but recently he was asking if he could have some money for something he wanted. I said no (for now) and he asked what he could help with to earn some money! It’s great to see them just pick this stuff up, isn’t it? Thanks for reading, commenting and sharing as always Nina! It’s a funny one isn’t it? I think it’s partly a lack of role models and partly the messages we see and hear – through school, the media etc. that we consume as kids. But it does seem as though things are starting to change – and of course we can be part of that change! Glad you like my blog 🙂 – hope you enjoy future posts! Thanks for reviewing us! We are very happy that Mushroom enjoyed the books!